If you are asking that question, the answer is almost certainly a massive and resounding “no”, both for the knowledge you’ll need and for the tools you’ll need to have access to. 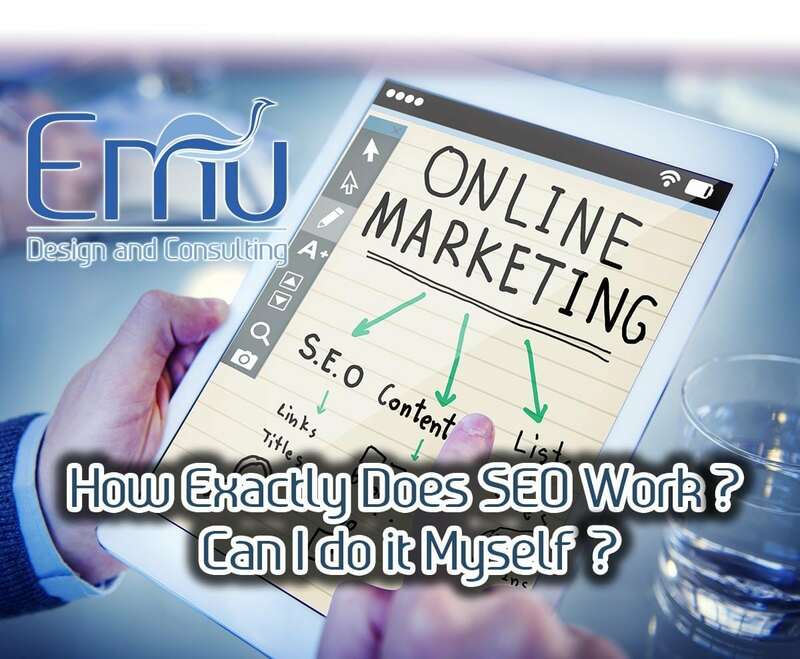 SEO, as defined by the crew here at Emu is “optimization that produces results“. 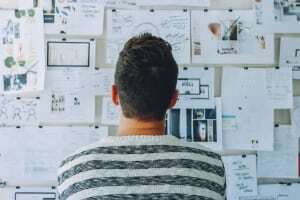 If you want to create results that are going to move the needle for your business and revenue, you are going to need to know what you’re doing. Since we get this question so often, we thought we would open up the doors to our process and show you a little bit about how we get results for our clients: the process that goes into creating great, SEO and people friendly content that ranks. This isn’t as easy as it sounds. Let’s go in depth a bit and we will show you some of the tools we use to hone in on what is relevant and topical to people right now. First, let’s make up an imaginary client. Let’s call them “ABC Pest Control”. ABC want’s more web traffic and online revenue, and they come to us and get the standard talk from Emu staff about how they need to have realistic expectations of the process and results that process will generate. They get it. They are one of the companies that want’s to win, and they aren’t afraid to spend some time and money to put them ahead of their competition. Great. So they hire us on, and we explain that in order to win online, there are no tricks or gimmicks. 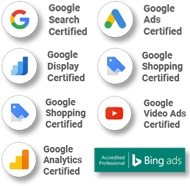 Google, Bing, and others have spend loads of money on search engines that have one main goal: to send their users to the best content on the web based on what search term they enter. So, simple conclusion: our client needs to have the best content on the web for their topic. There are no shortcuts. There is no “get rich quick” scheme. There is only being the best, because with online marketing more than any other industry, Ricky Bobby says it best: “If you aren’t first, you’re last”. There is also a saying in the SEO industry: the best place to hide a dead body is in the second page of Google search results, because no one ever goes there. We have lots of tools at our disposal, but one of our favorites is BuzzSumo. 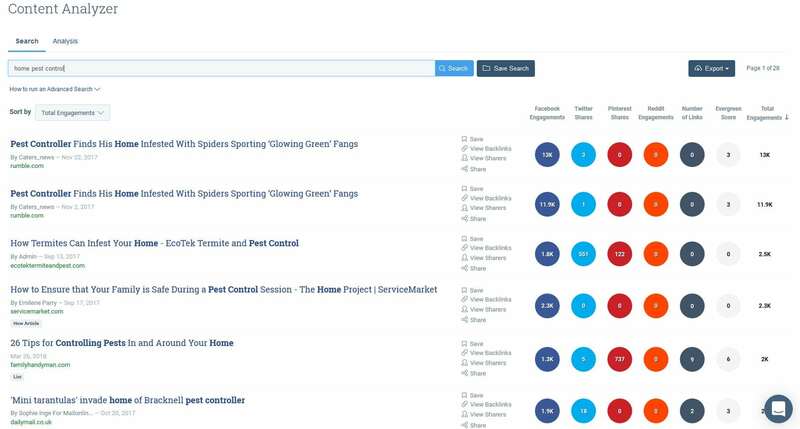 This tool allows us to put in a broad topic, like “Home Pest Control”, and see what people are discussing relating to that topic on the web. BuzzSumo tracks trending topics across multiple platforms and social media. While social media and organic search engine results aren’t the same thing, Steve Rayson released a paper that found that there is definitely a positive correlation between the two. If you have a topic that is trending on social media, it’s almost a given that that page will also be ranking in search engines. So let’s take a look. Okay, so some stories about pest controllers homes getting bug infestations, and some how-to articles. Since Writing articles for our pest control clients about their own homes getting invaded probably wont inspire much confidence among their readers and current/potential customers, lets scrap that idea. “How” articles seems to be a great place to start though, and we even have some good topics, like “termites”. If we search for just “pest control”, we might find some other topics that people are talking about. Yep, there it is. “How to” articles are the way to go with pest control topics, and they are almost exclusively shared on Facebook. 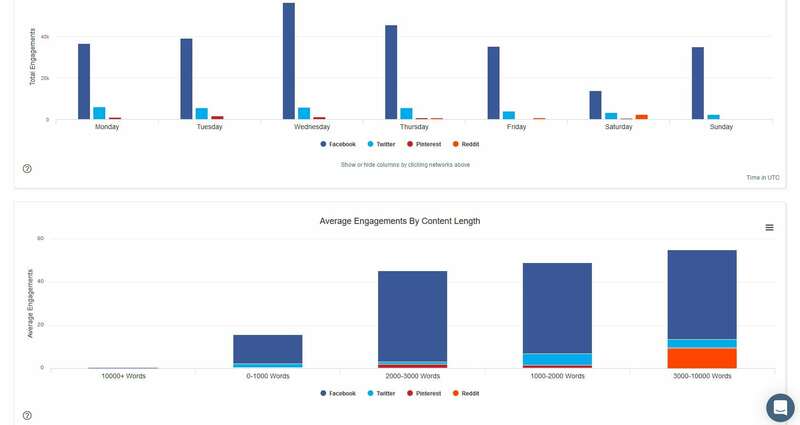 How long are the most-shared articles, and when are they posted? Okay, great. Looks like the sweet spot is a how-to article about wasps, roaches, or termites that’s is between 1000-2000 words and is posted on a Wednesday. Now, we need to hunt down some keywords for those topics that will get our client ranked. It’s important to be realistic here. 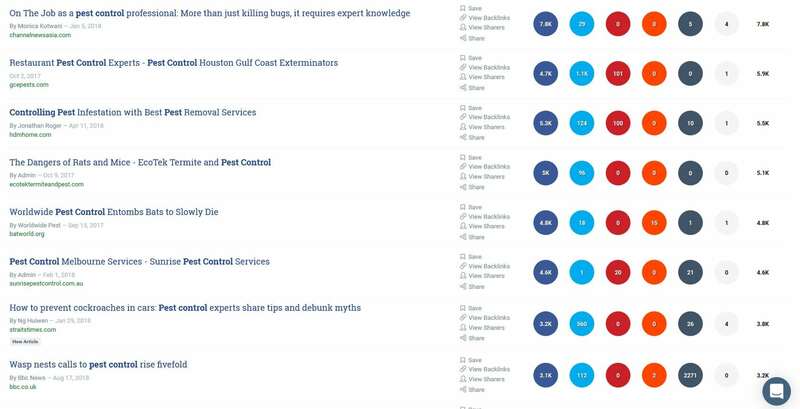 When we searched for a broad term like “Pest Control”, we found topics that had close to 8000 shares. However, those topics most likely aren’t going to bring our client sales. Traffic without sales is just ego on our part, and not what’s best for our client. Step 2: Find Out What Keywords Work and Which Don’t. 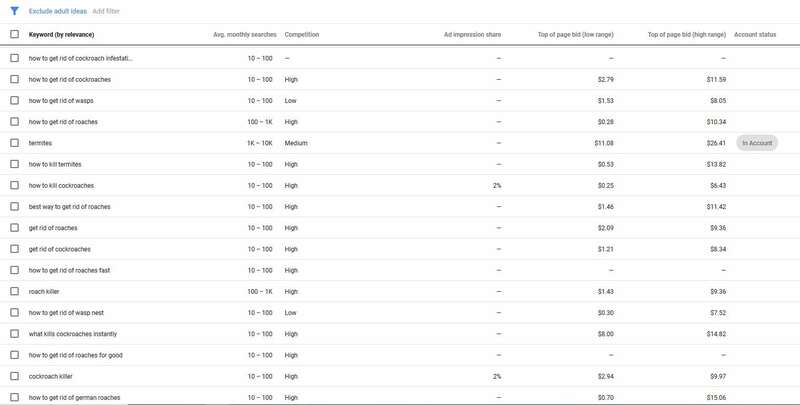 Lets head over to Google’s keyword tool and put in some variations of our keywords and see what we get, and add in some of the key phrases we saw in articles that got a lot of social shares in the last step. “How to get rid of roaches” is a much more popular term than “how to get rid of cockroaches”. I guess people always like to type as little as the possibly can. Let’s head over to another tool, Raventools, and enter that search phrase to see what the local search data for that term looks like. Okay, that’s really good search volume, and it looks like we are at the right time of year too. Volume is picking up. Maybe people locally have more issues with roaches this time of year. Regardless, it looks like a great topic. Now, we want to see how competitive this search term is. If we just Google that search term and use Moz’s toolbar, we can find the Domain Authority of the sites that are already ranking high for that search term. Anything low (in the 20’s) would mean this is a good topic for us. Anything high will mean the opposite, because it means the competition to get on the first page for that search term is going to me more rough. Two on the first page have pretty high Domain Authority, but the others are pretty low (20’s -30’s). Looks like we’ve found our search term! Now, we need to create an engaging title for our article. 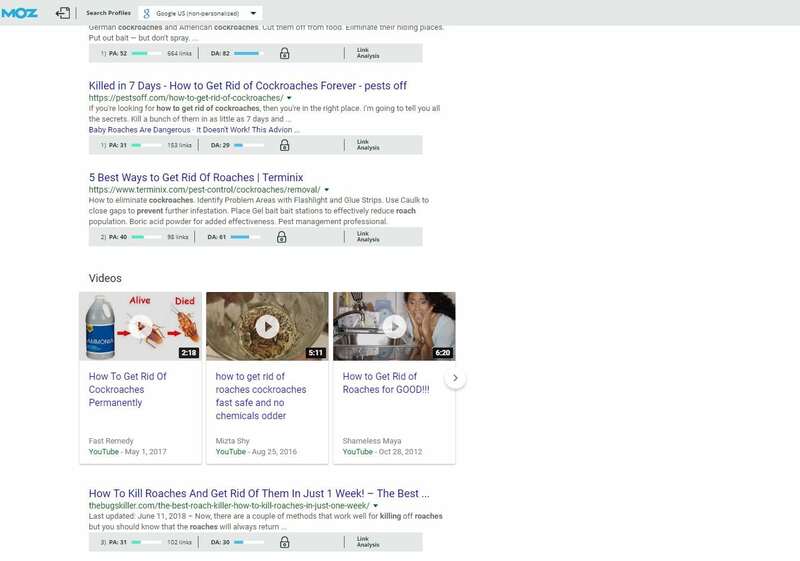 Based on the search terms we were seeing a lot of social shares with in step 1, and based on the volume data from step 2, it looks like we will be safe with an article titled “How to Get Rid of Roaches, Wasps, Termites, and Other Infestations.” It’s relevant to our client’s work, topical to our clients audience, and it targets specific keywords and key phrases that are likely to get our client’s page ranked. Great. Now, we need to write the article, and integrate those key phrases naturally throughout the content. We also need to make the article easy to read and above all interesting for the people who read it. As we tell our clients, the best content is optimized for people first, and search engines later. If you write content that is loaded with targeted keywords and key phrases, has excellent on page SEO, and it boring or tough to read, then your page will not rank. Simple as that. Search engines like Google and Bing are chasing people, and want to deliver search results with content that people like. Put that way, it doesn’t make a lot of sense to optimize our content for search engines first, does it? Even if we show up, if people aren’t reading or if they are bouncing off of our article page, Google is going to make us go down in rankings faster than… well, you know. So let’s assume that we’ve written an article that’s great based on the above guidelines, and we’ve also made sure that the article is 1000-2000 words long (remember the data we found in step 2?). Now what do we do? Once your article is complete, we need to make sure our on-page SEO for the article is on point. Our friends over at Moz have an excellent article on how to do just that. At this point, our research is done, our content targeted and crafted, our page is clean and optimized. We are ready to publish. Now that all our hard work has been put into the article, the real hard work begins. After all, all this hard work is going to be worth absolutely nothing if no one decides to read it, right? So we need to promote our content. We start by making sure that our articles are pushed to social media platforms: Facebook, Twitter, etc. Once there, depending on our clients budget, we might spend some money promoting our post to give it a little boost. We also want to reach out to some webmasters of pages related to our clients industry with high domain authority and make them aware of our article. One of our favorite tactics is to find such a page, run a broken link checker on the page, and hope that at least one of the links is dead. With enough hunting, you can almost always find a page having to do with your clients industry with high DA and a broken link. I was looking for some information on <Getting rid of roaches> today when I came across your list of <How to get rid of roaches> resources. Also, I recently published a guide on <Getting rid of roaches>. It might make a nice addition to your page. Either way, keep up the fantastic work! Thanks again! Maybe he’ll add our link. Maybe he wont. But one thing we do know is that if you don’t ask, the answer is no! Now we track our page and see how it did. Are people reading the article, or are they bouncing right off of our page? Are people sharing our article? Are people linking to our article? How many people clicked on our article? Is our article ranking? Is our article bringing in traffic? 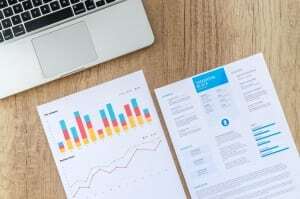 Take that data, evaluate it, make some judgements on what worked and what did not, and then refine the process until you are getting your client some top notch results. So what do you think? Seems pretty simple, right? The truth is, we skipped a few steps in this article for brevity. There are so many different tools, with so many different data sets, and so many different directions to go with each of them. In the end, SEO is a bit of a gamble. Sometimes content will go viral and bring in crazy amounts of traffic, and sometimes it won’t. Sticking to best practices and learning from past successes and failures is the key to teasing the results out of the algorithm that will make your clients love you. Good luck out there! And if this article was helpful to you, please consider sharing it!